This spring while we were doing parts of the planning together into Olympic National Park. Nivaun asked if I would like to join his friends and wife on a leg of their journey. Being up for the challenge for some additional miles to the original route set back last October. I had already been to some of the place in the route the year before; however this would be a chance to do some side trips. Last time through the area my backpack started at 70 lbs. No way in heck I wanted to go scramble a few peaks after going over the mountain passes; when it took everything in the gas tank just to get up the thing. This year was a different story with my backpack base weight just under 10 lbs. I had plenty of energy and by the time the group was ready to pitch camp. Had plenty of energy extra to burn; at times even grew restless. Decided to hitch hike out of the Upper Dungeness area. Which isn't an easy task in the beginning of a 4 day holiday weekend. Everyone was coming and no one seemed to be going. Took me almost 7 hours of standing around in 38 degree temps to get a lift down the hill. Thanks to the nice family that was willing to give me a lift. I wrote this blog, resupply now and head back into the wilderness. Have a craving for more high country before the snow hits. After a hitch back to town to get food. 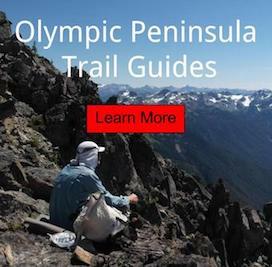 I would hitch a lift and then take the bus back out to the west side of the peninsula, to start the next leg of my adventure, solo Bailey Range Traverse, off trail across the Olympic National Park.